If you missed it, the last newsletter (read it here) focused on several of the tax bill's implications for housing and mortgage markets. It also gave a great rundown of recently stellar housing market data. The current week didn't have any amazing housing data--nor were financial markets even back to full power after the holiday break. That left plenty of time for conversations about some of the more confusing parts of the tax bill. Chief among these "confusing" parts is the topic of HELOCs or Home Equity Lines of Credit. Most news stories on the tax bill are quick to point out that HELOCs are no longer tax deductible. In actuality, they are subject to almost exactly the same changes as 1st mortgages. The simplest way to understand the tax changes that relate to deducting mortgage interest is with the concept of "acquisition indebtedness." Simply put: if debt was taken out to buy a home, that debt will always be deductible, even if it's refinanced in the future. Loans for homes under contract before 12/15/2017 get the old $1 million cap while everything after that gets the new $750k cap (for the next 8 years). Confusion arose due to the specific inclusion of HELOCs in the tax bill. The explanatory statement says: "Additionally, the conference agreement suspends the deduction for interest on home equity indebtedness." To be fair, that does sound pretty conclusive. To the untrained eye, it may seem that nothing about a HELOC is deductible from here on out. But consider this: "home equity indebtedness" is clearly and legally defined as "any indebtedness OTHER THAN ACQUISITION INDEBTEDNESS, secured by a qualified residence..."
In other words, it doesn't matter if it's a HELOC, 30yr fixed, or 5 million year option ARM. If it was used to buy the home or substantially improve it, it's deductible ($1m if grandfathered, or $750k otherwise). Shifting gears to interest rate movements, the past few weeks have been notable in that mortgage rates are performing as well as they have versus benchmarks in several years. What does that mean? A "benchmark" in financial markets can be thought of as a yardstick by which a certain financial instrument is measured. In the case of mortgage rates, the most widely-used benchmark is the 10yr Treasury yield. As today's first chart shows, there's ample correlation. In fact, there's so much correlation that it can be hard to see how mortgages are performing until we plot a separate line that simply measures the distance between mortgage rates and 10yr yields. That's what the green line does below (NOTE: the orange and blue lines look closer together than they actually are because each has its own y-axis in order to show the correlation in their movement). 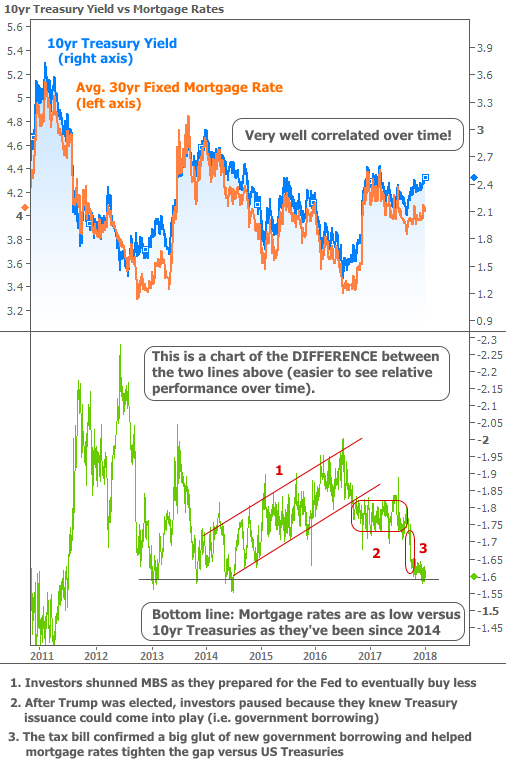 Keeping an eye on trends in 10yr yields is useful for mortgage rate watchers. It helps us see potential danger zones as soon as possible. With that in mind, the 2.48% and 2.50% levels have been acting as ceilings recently. 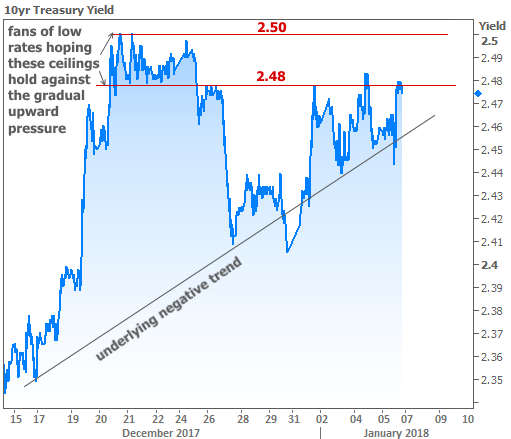 In short, fans of low rates would very much like to see these ceilings continue to hold. If they're broken, it could result in some sustained momentum toward higher rates to begin the new year.